I think we can all agree that standard headlights don’t always cut it. There are times when your factory standard lights are simply too weak, and you need an extra boost of power. Whether it’s on back roads in the countryside or in tough weather conditions, sometimes the brighter your headlights, the better. This is where aftermarket driving lights step in. They come in all shapes and sizes and can give you all the brilliance you need to dazzle your way across the countryside. There’s a problem though; the vast majority of driving lights are built to be mounted on 4WD vehicles. What about those of us who want some extra light for our day-to-day cars? Driving lights are usually designed to be attached to bull bars or mounted independently on the roof or bumper of a 4WD. But not every vehicle is designed for mounting accessories. And not all of us who need extra light want to bolt a spotlight to the front of our beloved cars, both because we like how the car looks as is, and because the law won’t allow it. If you feel like fitting aftermarket spotlights or light bars to your car is impractical, incongruous and potentially illegal, what can you do? What you need is something easy to fit, that’s discrete and road legal, and that means you won’t have to change that beautifully symmetrical face of your vehicle. “There must be an easy solution!”, I hear you cry! Don’t despair, we have you covered. Here at Ultra Vision, we’ve listened to what you, our valued customers, have to say. We’ve identified the problem, and after months of research and development, have come up with a hell of a solution (if we do say so ourselves!). Introducing the Nitro Smart 4-in-1 Multifunction LED driving light. 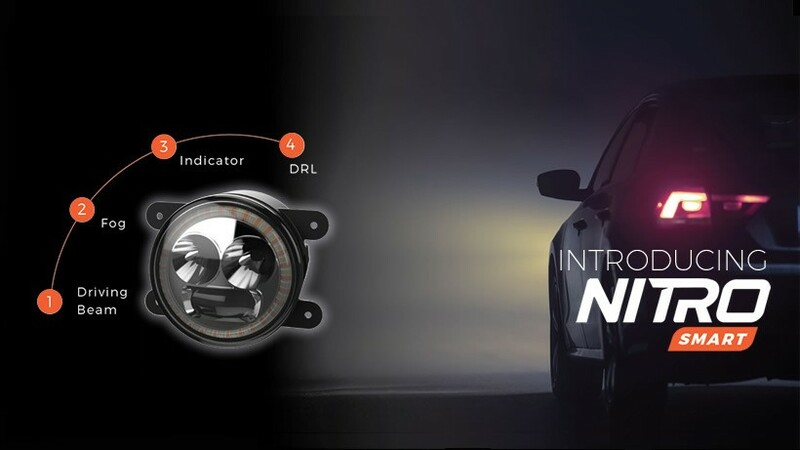 It’s a fully-integratable, super-powerful driving light that fits seamlessly onto almost any vehicle, without the need for mounting or any other physical alteration. Too good to be true, you say? Well, read on to see how we’ve achieved it. Our Nitro Smart driving light has been specially designed to fit into the existing hardware of your vehicle. So, rather than attaching an extra gadget, you simply swap in Nitro Smart lights for your existing bumper-mounted fog lights or DRL’s (assuming they are 4” round). In addition to that, not only do they work as a super-strong driving light (1 lux at 500m), they also function as normal fog lights, DLRs (daytime running lamps) and indicators. All functions are ECE approved, providing you with guaranteed road compliance. By adapting the housing mounts the Nitro Smart will slot into the existing light mounting on your vehicle for total discretion with all the benefits of an aftermarket driving light. The external adjustments also allow for tweaking to ensure that you get optimum performance with any load. 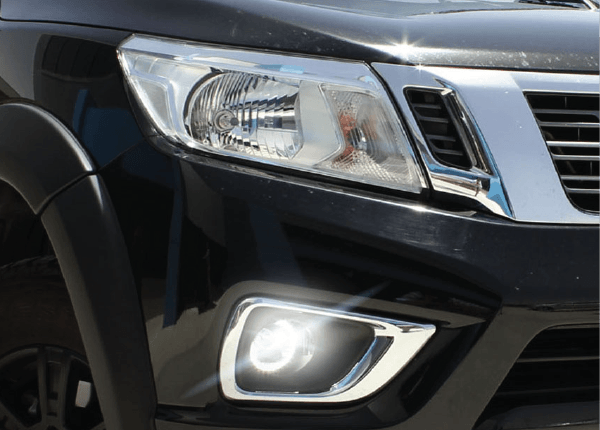 Delivering 1 lux at 500m (more on this later) without affecting the style or look of your vehicle, the Nitro Smart LED driving lights ensure that you’ll never lack that extra boost of headlights again. The most common location for our Nitro Smart driving lights is replacing the 90mm fog light in the bumper of your vehicle. Using a 4-point mounting system as standard, the light can be integrated into almost any bumper, and once it’s in place is indistinguishable from the original. Until you turn it on, that is. Built to be sturdy, with an aluminium housing and polycarbonate lens, the Nitro Smart offers 50,000 hours lifespan and Ultra Vision’s 5 year guarantee. Let’s have a look at what some of these more technical terms actually mean to you and me. For a full breakdown check out our whole series of articles dedicated to Making Sense of the Jargon around Driving Lights and Light Bars. When we say that the Nitro Smart delivers 1 lux at 500 metres, what do we mean? 1 lux is the accepted amount of light needed for a person with 20:20 vision to be able to read a newspaper. So, with the Nitro Smart lights installed, you’ll be able to read the paper half a kilometre down the road, if that’s what you fancy . Next up, the waterproof rating. A rating of IP67 means that the Nitro Smart light is dust proof and capable of withstanding water immersion up to 1m deep for 30 minutes. If you want some more detail on IP ratings, check out this article. The colour temperature refers to how ‘warm’ or ‘cold’ the light is. A candle is 1500k and daylight is about 5000k. Headlights start at about 4000k, and range up to 8000k. Anything above 6000k is blue light, and often illegal (and unnecessary). The accepted sweet range is 4000-6000k, for balancing definition and clarity, and the Nitro Smart, at 5700k, sits snugly in that range. Here at Ultra Vision we proudly produce the Nitro Smart and all of our other driving lights right here in Australia. That includes research and development as well as manufacturing. We firmly believe that manufacturing exceptional products locally is integral to the long term stability of our economy. An added benefit of this setup is that we can have complete control over the quality of of each and every component of our finished product. We’re proud to be Australia’s number one manufacturer of LED lighting for extreme environments, including the mining industry. Therefore, we take our responsibility when it comes to safety very seriously. Where appropriate, all of our lights are approved by the ADR and the ECE, the Australian and European safety standards bodies. We’re so confident of our high-performance, high-quality electronics that we’re happy to stand behind them. That’s why we offer a 5 year warranty on all our Nitro products, across the range. Whether you’re driving for necessity or pleasure, Nitro Smart lights will vastly improve your visibilityand safety without compromising the style of your vehicle. We’re delighted to have come up with a simple solution to a frustrating situation, and are very proud of the end result. We have a feeling you’re going to love it too. So here we are, coming to the end of our crash course on everything you need to know before buying a light bar or driving lights for your 4WD. Hopefully you’re feeling more clued in and confident, and are nearly ready to pick out your new lighting rig. This week we’re looking at the optics, colour temperatures, LED chips and light electronics. These are the last four areas that you should understand before setting about finding the perfect lighting rig for your vehicle. So, without further ado, here we go. We briefly touched on optics in week two, when we were discussing how lumen values actually work in real world conditions. An LED produces a fixed amount of light. How that light is used is what will determine how well a light bar or driving light will work on your vehicle.The optics of a light refers to how the design of the light uses reflectors to change the direction and intensity of the light that it puts out. Manufacturers use a whole range of different methods—there’s no right or wrong way here. What matters is the on-the-road result. This can be measured by looking at how far and wide the light is spreading, the wattage, and the lux measurements that we covered earlier. Colour temperature is measured in Kelvins (k), a thermodynamic temperature scale. To make it a lot less complicated, a candle is 1500k. Daylight is about 5000k. 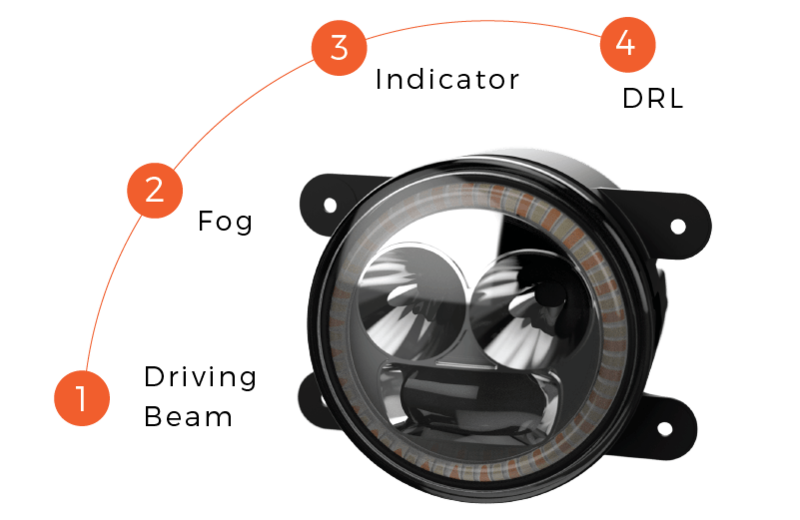 Headlights start at about 4000k, and range up to 8000k. Anything above 6000k is blue light, and often illegal (and unnecessary). The accepted sweet range is 5000-6000k, for balancing definition and clarity. If however, you want a ‘warmer’ hue, many people opt for the 4000k range. These lights can be very useful, particularly where there is a lot of mist and fog. The more yellow light penetrates the fog without reflecting back, allowing you to see further while avoiding getting blinded by the glare. Some manufacturers now offer 4000K as a standard option, specifically for this reason. This allows users to have the advantages of solid state LED technology but have the benefits of a yellower, warmer light. This is very much a personal preference, and a decision you’ll have to make on your own. As I mentioned in Week 3, the LED chip is the central component of an LED light. They are what converts the electrical energy into light. There has been lots of innovation in this field in the last few years, with companies like Cree, LG and Lumiled battling to produce the most efficient LED chips. In fact, Cree once dominated this market entirely but now many manufacturers are producing their own in-house chips. The main things that are to be considered with LED chips are light output, longevity and effects of temperature. As the technology has developed, the wattage value of chips has come down. Traditionally, a 10 watt chip was considered to give the best size to output ratio. Recently however, 5 watt chips have improved in quality significantly and are now the preferred choice. The reason for this preference is that the 5W chips dissipate heat better. 10W chips can create a hotspot which means that the light is more difficult to spread and the lamp cannot be worked as hard. However, as usual, the main deciding factor is cost. 5W chips are easier and cheaper to produce, and if they perform as well, if not better, they’re the obvious choice for manufacturers to use. Here, we’re referring to the unseen but vital inner workings of your LED light bar or driving lights. While they may not be visible they are absolutely integral to performance, and should be of only the highest quality. Some manufacturers opt for cheaper components, and this may be reflected in the cheaper overall cost of your setup. These components will be unable to withstand high temperatures for long periods without failing. This mightn’t be a problem if the light is only used briefly every once in a while. But the last thing you want is for your lights to start failing you in the middle of an overnight trip in the middle of nowhere. The first signs of failing electronic components is dimming of your lights. As the LEDs in your lights are usually grouped in mini-systems of 3 or 4 bulbs, you’ll notice one of the groups going out, rather than the whole light. A good light should also have a temperature control built in to the design. This system will automatically reduce the power to your lights if they get too hot, thus saving them from permanent damage. Once the lights cool down enough, the system will automatically return the lights to full power. Having your lights on whilst idling is a surefire way to build up heat quickly. Without a temperature control system, they’ll burn out in no time. If the light manufacturer doesn’t specify whether they include a temperature control or not, just ask. Also, always check the fine print of the warranty to see if you are covered against overheating of the lights (it’s a very common problem). It can be very frustrating to burn out your new lighting rig by forgetting to switch them off when you’re stopped. So there you have it, our guide to the most important terminology and jargon you’re going to encounter when researching a light bar or driving light setup for your vehicle. Hopefully we’ve left you feeling much better equipped to tackle the often confusing world of auxiliary vehicle lighting. The perfect lighting rig for you is out there, now it’s time to go out there and get it! Armed with all your newly-learned knowledge you’ll be able to make the best decision and be blazing up the trails in no time. This week we’re going to look at how your light bar or driving lights are actually put together, and explain what you need to know about their construction before you buy. Then we’ll move on to the many ways that you can attach the lights to your 4WD. Firstly, let’s look into some of the different components you’re going to see mentioned when you’re reading up on which lights to fit to your 4WD. If you plan to do regular water crossings, make sure your lights have a breather valve of some description. It’ll save you the heartache later. If they don’t have the valve, make sure your warranty covers condensation issues. Depending on the manufacturer, lens covers will come as part of the light, or will be sold as an accessory. Either way, you’re going to need them to keep your lamps in good condition. Typically made from either acrylic or polycarbonate, each material has its benefits. Acrylic gives better clarity, is UV resistant, but tends to be more brittle. Polycarbonate needs to be UV treated but is tougher and more impact resistant. Whichever you choose, it’s important to look for lens that are ‘hard-coated’ by the manufacturer to avoid scratches. If they don’t mention hard-coating, then they probably haven’t done it. Lens covers are essentially sacrificial, and will need replacing eventually, but the hard-coating helps to prolong their lifespan. Nearly all LED lights use an aluminium housing, as it’s a great material for transmitting heat away from the lamps. Heat is the enemy of the LEDs central component, the LED chip, so manufacturers put a lot of time into helping the heat to dissipate. I’ll deal with LED chips in much more detail next week. Driving lights generally use a process called casting where molten aluminium is poured or injected into a mould. Light bars, on the other hand, use a process called extrusion which uses higher pressure and is therefore more effective as a heat sink when comparing gram for gram of aluminium used. Some manufacturers make a big deal about the shape or direction of their ‘cooling fins’ which are supposed to aid cooling. This is largely marketing spin. The main cooling effect comes from driving. A 5-10km/h wind will be much more effective at cooling than the design of the fins. Getting a balance between good heat transfer and having a lamp that’s not too heavy involves skilled engineering. Recent developments, along with higher efficiency LEDs, have helped reduce the overall weight and cost of housings drastically. As I mentioned in Week 1, all this innovation is great for the end consumer. The final thing to look out for when looking at housings is the coating. Black powder-coating is the most common, and works very efficiently, however it’s important to check if the powder has a UV stabilising agent. If not, the housings will fade in the sun, something which will rarely be covered by warranty. If this does happen, you can always re-do them yourself at home. This is an area where safety is the best policy. A dodgy wiring harness can not only damage your lights, it can potentially cause a fire and send your whole vehicle up in smoke. We definitely don’t want that. The safest option here is to always stick to the harness that the manufacturer supplies with your lights or light bar. Using the wiring from the old set of lights that you’re replacing might sound like a good way to save a few dollars, but LED lights take a lot more wattage than your old HIDs. If you can’t get the harness from the manufacturer, reputable lighting manufacturers sell harnesses, and are sure to have something to suit your wattage. Failing that, get a qualified auto-electrician on the case.They’ll make sure that the harness is robust enough to handle your power requirements. Next up, let’s look at what you can use to attach a light or light bar to your 4WD. Once you’ve decided where on the vehicle you want to mount it, you’ll need to look into what brackets to use. Finding the best lamp in the world and choosing the ideal lighting output for your needs is all well and good, but will be a total waste of time if the light falls off your truck after a week! When picking where to mount your driving lights or light bar, keep in mind that you’ll want to drill as few holes as possible into your bull bar. Find a system that needs the least holes, or that will fit existing holes. First up, powder-coated mild steel. This is typically associated with cheaper lamps. These brackets have a tendency to break under pressure, especially at weak points. They can also tend to get scratched which leads to rust. Enough said. Plastic is being used more commonly these days for LED light brackets. There’s no rust worries, but there is the risk of a ‘whip’ effect, as the plastic can flex. What that means is that you might notice a bounce at the end of the beams, especially with a pencil-beam lamp. Die cast aluminium is a very common type of mounting bracket, because they’re cheap to make, lightweight and won’t rust. Depending on how heavy your lamp is and whether the bracket is on the side or base, the aluminium can fail and crack, especially on corrugated roads. Leaving the best to last, we have stainless steel. It lasts the longest, and won’t rust. Brackets vary from 1mm to 4mm thick, and therefore vary in price and strength. A well engineered 2mm bracket should fare well in most conditions, and give you good value for money. It will also avoid rust dribbles around the holes and nuts. When using any of the above materials it’s a good idea make sure the warranty covers the breaking of brackets and the corresponding damage to the lamps. At this point, a slight diversion is in order, to talk about warranties, as these are something you really should take into account when choosing your lighting setup. Warranties for LED light bars and driving lights usually range between one and seven years. An LED should operate for 50000 hours under normal conditions, so a 7 year warranty is reasonable. The original cost of the lights will often dictate how watertight the warranty is. It’s worth your while really reading the fine print here to find out how covered you really are should an issue arise. Often, the best warranties come from the companies who actually fit the lights, rather than the manufacturers. However, they should also be able to tell you how much support the light manufacturer will give, as well as their own warranty policy. If you’re fitting yourself, do your homework extra well! Read reviews by others and study the warranty page on the manufacturer’s website. With that out of the way, it’s time to get back to the technical stuff. Next week, in our final installment, we’re going to go through some more of the terms and concepts that you need to swot up on to ensure you get the perfect setup for your 4WD. See you then! Welcome to week 2 of our 4-part series on cutting through the bunk and cluing yourself in about light bars and driving lights. In this instalment we’re going to go over the general terminology that you’ll encounter when setting out to find the perfect light set up for your 4WD. The following are the ratings and measurements that you’ll see displayed all over the marketing material for your light bars and driving lights, and it’s vital to know what these values really mean. Lux refers to how the light will actually illuminate what’s in front of you. It’s a measure of the intensity of illumination on a surface at a set distance from your vehicle. 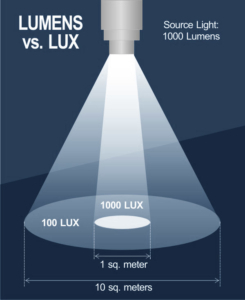 1 lux is equal to 1 lumen per square metre (more on lumens later). What you’ll read in descriptions is usually measured in lux units at a certain distance, for example a light will offer ‘1 lux at 1km’. This means that your beam will illuminate an object 1km away to a brightness of 1 lux, or 1 lumen per square metre. To put this into perspective, 1 lux is the accepted amount of light needed for a person with 20:20 vision to be able to read a newspaper. So you’ll be able to read the paper a kilometre down the road, if that’s what you fancy . Ways of measuring this value can vary, but lux values are generally accepted as a good standard measurement of how your lights will perform on the road. As a rule of thumb, if the lux levels are high but the lumens are low, your beam will be narrow. If the lux is low the beam will be wide, but won’t project far down the road. Keep in mind that lux readings can be taken ‘on the road’ or in laboratory conditions. Readings taken on the road are more realistic, but also more difficult to get. A lab test will usually take a measurement at 25 metres in ideal conditions and then simply multiply the results to get a number for 500 meters or 1km, which means that in the real world the results may be very different. Be wary of this term, it’s very vague. Lux is a real objective measurement, usable light is not. Some companies will claim that 0.5 lux is a usable brightness, but this will depend on how good your eyesight is and what you are hoping to see. With 0.5 lux of usable light, you’ll see a car 5 meters away without difficulty. However, you probably won’t see a kangaroo 50 metres away. While a usable light value doesn’t explain much in itself, it can be used as an objective reading of how far a light will shine when compared to other lights that display the same scale. Lumens refers to the amount of actual light that your light bar or driving light will produce. The thing to remember here is that ‘raw’ lumens and ‘effective’ lumens are two very different things. The first thing to know is that the ‘raw’ lumens figure is basically useless to you and me. It relates to the how the LED can perform in optimum, factory-testing conditions. What we want to look at is the ‘effective’ lumens—how much light the lamp is producing based on how hard the electronics are working in the real world, taking into account factors like temperature and electrical current. A lamp that is running hot may only give off 50% of its potential power. It is also important to note that how the light will actually perform when driving has a lot to do with how it is controlled. If the light is focused 100m down the road it will be very different to it a wide spread. Optics or reflectors will control how the light will actually spread. Don’t worry, we’re going to deal with optics in more detail in week four of this series. All this means is that the effective lumens value is much more useful to you and me. It accounts for thermal losses, optical losses and the actual current that is being used. Be wary of manufacturers that don’t disclose an effective lumens figure. One thing to keep in mind is that as this technology improves, light is controlled more effectively by the use of those clever optics that we’ll look at later. This means that overall lumen values are starting to decrease. This is why using lumens as a deciding factor for which lights to buy is dangerous—a lux value is a much more accurate indicator of performance. IP stands for ‘Ingress Protection’, and is an international standard measurement of how well an electrical enclosure can keep out ‘foreign bodies’—in this case dirt, dust and water. IP ratings are displayed as the letters ‘IP’ followed by two numbers, each one of which has a meaning. The first number is the level of protection from dust and debris, the second is the level of protection from moisture. Simple as that. Common values that you’ll see here on light bars and driving lights are IP67 and IP68. IP67 means that the light is dust proof and capable of withstanding water immersion up to 1m deep for 30 minutes. The difference with IP68 is that is capable of withstanding water immersion up to 3m deep for 30 minutes. In practice, we don’t expect your 4WD to be 3 metres under water for over 30 minutes (we hope not anyway! ), so a rating of IP67 is more than enough. Something to double check here though is that the lights will be able to sustain pressure washers at close range. Look out to see if the manufacturers have a disclaimer against this, as many do. Another factor to keep in mind when submerging your lights is temperature. Crossing a river when your lights are hot can cause aluminum housings to contract and allowing water to enter through the seals. Even if this doesn’t happen, condensation can be a problem, despite a lamp being totally watertight. Don’t worry though, there’s a solution to that—the breather valve. And luckily that’s the first thing we’re going to look next week in part three of the series, which is all about the construction of the light and how you attach it to your 4WD. See you there! Light bars and driving lights – possibly the most confusing and time-consuming thing to research when rigging out your 4WD. Surely this should be an easy choice, I hear you say. Not likely! There are just so many options and variations, it’s impossible to know where to start. Then there’s the terminology and jargon. It can feel like you need do hours of background research before you can even start to look into what you might want to buy! As we know, this stuff doesn’t come cheap, so you really want to know that you’ve made the best decision and not missed something that you’ll regret later. Manufacturers seem to purposely baffle you with science, to the point where you don’t know who to trust or what will actually work for your needs. This means that many people just give up and revert to a brand they trust, even if there are far better choices out there. Unfortunately, this confusion can extend to the companies that actually install vehicle lighting. Much too often they simply stick to one setup, or go with whichever lighting company is giving them the best kick back. To us, this makes no sense. We believe that you should be fully clued in before making your decision. This will ensure that you make the best choice and get your set-up right first time round. That’s why we’ve put together this series of articles—to help you learn and understand all the specifications and terminology that you’ll need to know to make the best choice for your lighting. By the end of it you’ll know your lux from your lumens, and be able to out-jargon the slickest salesman! For the next three weeks we’ll break down the most important things to know, from what mountings will work best for you, to the best colour temperature for foggy conditions. Next week we’re going to look at the most important terminology and vocabulary that you’re going to come across when deciding on your lighting set up. In week three we’ll deal with the construction of the lights themselves and how best to attach them to your vehicle (we don’t want them falling off!). The restriction of the power of headlights by ADR regulations means that standard headlights are becoming dimmer. Couple that with the fact that the variety and quantity of wildlife on our roads is steadily growing and you’ll clearly see why the need for auxiliary lighting is only going to increase. Road safety is the priority here, and good lighting is an integral part of your vehicle’s safety armory. As demand for extra light bars and driving lights increases, the available choices are only going to multiply. New types of lights, mountings and wiring setups are coming out each week. That’s why being fully clued in is vital to cut through the marketing bunk and knowing exactly what you’re after, before you start spending. Good news, though, is that you’re buying at a great time. This high demand is driving down prices and increasing innovation (as we’ll see later), meaning that you’ll get the best kit and the best value for money. We’ve covered how to choose between a light bar and a driving light in a previous blog post, but suffice to say that with modern technology this is really a cosmetic choice for you to make. One may also fit better on your bars,or the type of bars you have may mean that one or the other is safer and more practical. Either way, by the time you’ve read these four articles you’ll be able to confidently choose the right set up for your personal needs, and end up with a lighting rig that you’ll be de-light-ed(!) with for years to come. Which Light Bar do I Choose for My 4WD? So, you’ve decided it’s time that you need more light in your life, and you’re ready to invest in an LED light bar for your 4WD? Time to start doing some research then. Trouble is, Google turns up millions of results, and everyone has an opinion on what’s best. No one has the time to trawl through hundreds of reviews, sales pitches, and opinion pieces. Even if you did, a conclusive answer wouldn’t be easy to find. Luckily, we’ve put in the hard work so you don’t have to. Read on to find out how to make the best decision and avoid buying something you’ll regret later. When it comes to asking yourself, ‘Which LED light bar do I choose?’, the first thing you need to look at is your own individual needs. Your set up isn’t going to be the same as the next person’s, nor do you want it to be. There are hundreds of options available online, and sorting through them can be baffling. To make life a bit easier, we’ve put together the following list of the top four decisions that you’ll need to make. For each one, we’ll explain how it relates to you and your truck and hopefully make the whole process a lot more straightforward. Next, measure the space available, this will give you a general idea of what you’re after, and help narrow your search. If you’re mounting your light bar into a gap on the bull bar, in the bumper, or on a number-plate bar measure your length, height and depth. Double check your calculations to avoid frustration later! Next, figure out what you want to pay. Price will be very relevant to the size—a large bull bar light may not fit a small budget! Pick a ballpark figure and stick to it, it will allow you to reduce your options drastically straight away. Remember though, before you set your price, that the level of ‘lux’ and ‘lumens’ will also affect the cost. I’ll deal with those two terms later, in Decision #4, so hold off your calculations until then. If you don’t want to drill new holes into your bull bars or bumpers, then look at what will fit the existing holes. Typically, there are two options here; full length U-brackets with slots or sliding base mounts which allow you to line up with the existing holes. Be warned that some LED light bar systems come with fixed side-mount L-brackets only. This will almost certainly mean you’ll have to drill new holes into your shiny new truck, something many of us won’t have the heart to do. This one is really down to personal taste. Do you want stand out and make a statement, or blend in with a more discrete set-up? There are options to suit every taste. Firstly, how many rows of LEDS do you want? As height isn’t usually too restricted, you can decide if you want single, double or even multiple rows of LEDs. Next, pick your colour scheme. Choose coloured rims to match your truck, and decide what colour temperature you want for the lights themselves. As mentioned earlier, levels of ‘Lux’ and ‘Lumens’ are vital factors to consider when deciding which LED light bar to mount on your 4wd. These are what will determine the actual strength and direction of the light that your rig will give out. When researching levels of lumens, you’ll see the terms ‘raw’ and ‘effective’. First thing to know is that the ‘raw’ lumens figure is basically useless to you and me. It relates to the how the LED can perform in optimum, factory-testing conditions. What we want to look at is the ‘effective’ lumens—how much light the lamp is producing based on how hard the electronics are working in the real world, taking into account factors like temperature and electrical current. Unfortunately, many cheaper manufacturers only display a raw lumens value. Do not be fooled by a high value here, especially when no ‘effective’ lumens value is shown. ‘Lux’ refers to the actual shape of the light on the road. The optics or reflectors will control how the light will actually spread. As a rule of thumb, if the lux levels are high but the lumens are low, your beam will be narrow. If the lux is low the beam will be wide, but won’t project far down the road. These days, one can choose different optics depending on your beam preference. You can have pencil, spread or combo, and these will have different lux and lumens values to create these varying effects. Choose carefully when making this decision, remember that hilly, twisty terrain will call for very different beams to flat, straight roads. Ideally, find a friend with an LED light bar installed and take their truck out for a drive to see if you like their setup, then choose yours accordingly. So there we have it, the four main things to keep in mind when deciding what light bar to choose for your 4wd. These should help you to avoid the pain of choosing a light bar, buying it, mounting it, and then realising a few weeks down the line that it isn’t for you. By taking all the above into consideration you should make the right choice first time, and be blazing the trail with your shiny new light bar set-up in no time! If you’re feeling less than wistful for this not-so-halcyon era, you’re in excellent company. Today’s Aussie off-roader is spoiled for choice like never before, and there’s no doubt that we’re all better off for it. However, as the lighting options have increased exponentially, so has the level of confusion: Which lights are best for your 4WD? LEDs, halogens or HIDs? Are cheaper imported products the same quality as Australian made driving lights? Should you use plastic or stainless steel brackets to mount your lights? Are you better off going for outstanding depth of light, a greater spread, or a combination of the two? And, while we are at it, what’s the deal with lux vs lumens, and how do I know how much effective light I’m really getting? If all that is not confusing enough, there are now numerous suppliers on the market, each of whom makes a claim to the title of best LED lights for 4WDs in Australia. It can be tempting to make a call based primarily on price. However, some suppliers include the cost of the wiring loom and fittings, whereas others do not, just to add another layer of complication to your decision. With so much going on, the average consumer can be forgiven for scratching their heads, yelling “stuff it!” and just going fishing instead. While that does sound like a spectacular idea, we figured the time has come for an honest and candid assessment of some of the best brands in the land. We’ve focused on those that are well known primarily in the 4WD space and listed them alphabetically in no particular order of preference or performance/value rating. We hope this helps shed some light – pun fully intended! The construction, presentation and branding for these guys are in keeping with their well-deserved excellent reputation. ARB lights are well made and look fantastic. The lights are quite slim, allowing them to fit most vehicles easily. However, a slight kick-out to the rear can make them a little bit tricky to attach to some of the narrow bull bars. Given the price point, you could be forgiven for expecting somewhat better light output, especially since the RRP doesn’t include wiring loom and anti-theft nuts. However, this would need to be weighed against the generally polished presentation and construction. It’s worth checking ARB’s website to ascertain whether their light pattern works for you prior to taking the plunge. While strictly speaking not a 4WD light, Kings have captured a sizeable share of the Australian market thanks to their highly attractive pricing. This is partly due to their direct-to-market business model. However, as you might expect, at a price point up to 12 times cheaper than some of the competitors, the lights themselves are relatively basic. Any misgivings about the construction and/or performance should be weighed up against the cost. If you’re an occasional off-roader, you’ll likely find that Kings delivers exceptional cost performance. Conversely, if you’re a serious driver who really puts their rig through its paces, you might find forking out for a hardier option a better investment. As you’d expect, the wire harness and anti-theft nuts are not included in the retail cost of the product. This versatile workhorse ticks all the boxes for solid construction and presentation. The slim design makes them perfect for mounting on virtually any vehicle, and the HTX utilises an ingenious HID/LED hybrid system that delivers superior distance at 1 Lux compare with anything else on the market. Lightforce light bars come with only a side-mounting option, which is slightly limiting. However, if you’re OK with that, you’ll find plenty of size options to choose from and reliably solid constriction. Some people list mounting as a concern with these products as the brackets appear a touch flimsy. However, to our mind, this doesn’t seem to have any practical implications, although the fact that they have only one bolt can result in a tendency for the units to shift a tad during use. Some Lightforce products are sold with the wiring harness, while others are not, so pay close attention when evaluating from a cost perspective. We’re pretty impressed with this product as an overall strong performer. They’re well-made and give impressive distance, which is what you’re looking for in a light. The design of the body is quite deep, which may impact mounting on narrower bars, but this is unlikely to be a problem for most vehicles. Narva offers some outstanding features, such as optional rim colour customisation and a manual adjustment thumb screw. We’re yet to put the latter through its paces in serious off-roading, so we can’t vouch for how it holds up, but keep this in mind when assessing. The Clark Kent of the LED lighting world, Stedi lights are sensibly designed and strike a safe balance between price, performance, specifications and durability. If you’re on a middle-of-the-road budget, you’ll find these products offer arguably the best value in their mid-range market bracket. This is given further weight by the fact that products are regularly sold with the wire harness and lens covers, which is a huge bonus. It should come as no surprise that we’re quite partial to this one! Trying to keep our objective hat on, for the time being, Nitro LED light bars and driving lights have quickly carved out a loyal following and reputation. The fact that the lights are manufactured in Australia undoubtedly contributes some significant street-cred, which is backed up by superbly performing optics, a 5-year warranty and secure installation, thanks to the solid 4mm stainless steel brackets. The presentation is not quite as polished as ARB, but the performance is spectacular. There you have it! Everything you need to know to select the right option for your vehicle. We told you there was plenty to consider next time you’re in the market! Each supplier has its merits and a part to play in a market that is growing larger and more complex. To make matters just that little bit extra exciting, specifications, beam patterns and designs are constantly changing, meaning that by the time you read this, it’s almost certain that at least one supplier has rendered some of the information out-of-date. Nevertheless, with all the crucial information now right at your fingertips, you’re in a great position to make the most informed choice regarding the perfect solution for your 4WD. The first step is to figure out the mounting location. You’ll need a sturdy location such as the roof or the bulbar. We’ve seen some people try to get fairly creative with their mounting positions. However, before you make a final decision, it is definitely worth checking your State regulations on installing LED light bars to ensure that your lights are legal and avoid a potentially hefty fine. Once you’ve found the best place to mount your LED light bar, secure it firmly using the brackets provided. The excitement of installing you LED Light Bar is the only jolt you want on this job. Start by disconnecting the negative terminal of your battery to ensure that there are no hair-raising surprises. There’s no hard and fast rule about where to mount the relay and fuse, in many cases, utilising an existing bolt or self-tapping screw on the inner guard is usually a pretty reliable option. However, this is where it starts to get a little bit tricky. Where and how you connect the loom supplied with your LED light bar will depend upon the make, model and age of the car to which you are hooking it up. If you’re a total car maven, you may feel like you’ve got this one, however, get it wrong and you’re in for some fascinating pyrotechnics that could severely damage your vehicle. If you’re not all that keen to have yourself or your car go up in flames, your best bet is to consult a professional. Our good mate Alan and Piranha Off Road Products has installed more Ultra-Vision LED Light Bars than anyone. If you’re in his vicinity, you could do a lot worse than enlisting his services to hook your lamps up for you, or provide you with some sound advice. Alternatively visit out stockists page to find the qualified auto electrician nearest you for a bit of assistance. You want to make sure that the switch is easily accessible to you without distraction or the need to take your eyes off the track, so be careful to locate it in a convenient location inside the cab. You’ll then need to run the switch wires back through the firewall and into the engine bay to connect with the wire harness. Your best bet here is to use an existing grommet in the firewall that will provide the most direct and easy access. Make a small incision or hole in the chosen grommet and run it through. If you’re finding it tough to access in the tight spaces, you can splice the wire to a straightened-out coathanger or a scrap piece of fencing wire to help it through and save you some sweat and frustration. You’re almost there! Now, all you need to do is connect your two harnesses to each other using the remaining open plugs. Lastly, it’s time to connect the plugs for your LED light bar into the circuit. Your light bar wire will include a single plug, which you need to connect to the relay; and a ring-terminal that must be earthed. Either the negative terminal of your battery or a bare metal bolt that has direct contact with the body of the car will suffice for the latter. Untidy wires are an eyesore and a safety risk, so take a few moments to tape up any loose wires or plugs. Reconnect the negative terminal of your battery and test your new baby out! As we said above, the LED light bar should activate with your high beams, so set your switch to the on position, pop your headlights on, have someone perform a dramatic drumroll and when you flick on your highs, you should have oodles of blinding light streaming out of your new, freshly installed NITRO Maxx LED Light Bar. To double check that you’ve done everything correctly, switch your light bar off. If the high beams remain on, you have passed LED light bar installation 101 with flying colours! We’re always here to help, so if you have any questions or run into problems, drop us a line or get in touch with your stockiest. Good luck and happy 4WDing! It’s no secret that the aftermarket LED lighting industry has become a bit of a complex maze of confusing specifications, conflicting claims and impenetrable statistics. The truth of the matter is that there are plenty of excellent products available at every price and quality point. The trick is figuring out which product and brand are best for you. What the numbers don’t show is that pound-for-pound, the Nitro Maxx range delivers the ultimate balance of exceptional distance, width, and sharp definition. We’ve combined the most advanced optics on the market with our unique reflector designs to ensure that we hit the sweet spot that shines the way ahead to enables safe, exhilarating off-roading. Australian off-roading conditions are arguably the harshest on the planet. Our lights are built to withstand the sternest tests that mother nature can throw at them. We’ve carefully selected the sturdiest materials and coupled them with state-of-the-art design and construction to ensure that your lights will go the distance. In most cases, they will last you longer than the life of your car. We also ensure that each unit is supplied with rock-solid stainless steel or stainless/alloy brackets so you know it’s securely mounted for the long-haul. We’re so confident in the quality and longevity of our products that we offer a comprehensive 5-year warranty that covers all parts. You’ll have complete peace of mind in the knowledge that even with frequent use in the toughest environments, your investment is covered. Despite so many cheaper alternatives coming from overseas, the decision to manufacture the Nitro Maxx range at home was a straight-forward one. Firstly, it gives us total control over the production process, something that is not possible with cheap imports. This assures us unparalleled quality control, hence why we have the confidence to offer a comprehensive 5-year warranty to our valued customers. 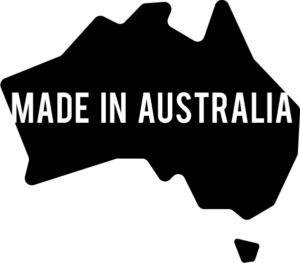 Just as importantly, making our products at home is a powerful statement of our commitment to Australian manufacturing and Australian jobs. In an age where local manufacturing jobs are dwindling at an alarming rate, it’s immensely satisfying to know that by choosing the Nitro Maxx range for your vehicle, you’re doing your bit to support hard-working Aussies. We know that our customers want choice. 4WDers are a unique lot, and we want that reflected in our vehicles. Ultra Vision is committed to providing as many options as possible for you to customise your lighting. Choose from side or base-mounted brackets, 4000K or 5700K colour temperature and optional rim colour matching for a coordinated look. We’ll even throw in a wire-harness and anti-theft nuts for good measure. While there are cheaper options on the market, we know of no other product that offers the kind of performance, quality and durability at as affordable a price. We know that consumers have a wide array of options. That’s why we’ve left no stone unturned to ensure that Nitro Maxx is the best long-term investment available. It’s all these outstanding features that we believe make our Nitro Maxx the best LED Driving Lights and LED Light Bars in Australia. If you’re thinking of upgrading your lighting, or replacing your existing after-market lights, visit our online store, find your nearest Nitro Maxx stockist, or drop us a line for more information. We know you’ll be happy you did. When you’ve been in the LED lighting game as long as we have, you tend to think you’ve seen it all. However, even we are left continuously gob-smacked by the unfeasibly shonky aftermarket LED lights that we see from time to time. Well-meaning punters are hooked and reeled in by the lure of prices that look too good to be true, and inevitably are. Let’s get one thing very clear: Australia is a harsh land populated (latte-sipping, smashed-avo-munching, man-bun-wearing types aside) by hard men and women. To survive all this country and its off-roaders can dish out, LED Driving Lights and LED Light Bars need to match them for toughness pound-for-pound. Unfortunately, the low-low prices offered by manufacturers, predominantly based in a particular nation to the North that may or may not be Australia’s largest trading partner, prove too appealing resist. Too frequently, customers come to us with hair-raising tales of lights that fizzled out after a couple of months, caught fire or came to an explosively pyrotechnic end. Whatever these poor souls thought they had saved ends up evaporating before their eyes in a wisp of smoke and jarring fade to black. If they’re lucky, they’ll get away with only having to replace the lights with a more reliable version. In the worst cases, overheating and electrical fires can cause untold thousands of dollars of damage to precious vehicles. If you live or regularly drive through territory with high moisture or frequent water crossings, condensation is a constant threat. A hot lamp wading through water will experience rapid pressure and temperature changes that can quickly cause it to fog. If your breather is faulty or missing, the performance of your lights will diminish drastically. There is nothing more heartbreaking than seeing a perfectly good light obliterated after detaching due to faulty brackets or mounts. Spending a fortune on lights makes no sense if you’re going to skimp on the fittings and end up kicking yourself when they’re strewn across the road or trail in a thousand pieces. Worst of all, a broken bracket is frequently not covered by warranty, leaving you up a certain estuary without a certain means of locomotion. There is just no excuse for using shoddy housing. Any light worth its salt will utilise aluminium housing that is cheap enough and acts as an efficient heat sink. Manufacturers that try to save a few pennies by using inferior materials run the risk of their lights overheating, or not sealing properly against dust and water. With so many high-quality, reasonably priced options available on the market, using inferior chips is bordering on criminal behaviour. The concerns here are longevity and heat. Poor construction can lead to outages. Overheating, well, you know the story. Most manufacturers today utilise 2 x 5W chips rather than the previously popular 1 x 10W chip. The 5W option generates less heat and is less expensive anyway, so it makes little sense to take any other route. The silent achiever of the LED lighting world. Electronics are a crucial part of the performance and longevity of a product. Unfortunately, they’re often overlooked when assessing quality as the components are rarely if ever, itemised in the paperwork. Poor quality components are frequently unable to withstand the high temperatures associated with regular use. Drivers taking their rigs out frequently or over long distances can be left counting their losses when lamps fail, sometimes within weeks of purchase, due to dodgy electronics that are not covered under warranty. Poor temperature control can result in a build-up of heat that can overwhelm even the best-quality materials if it has nowhere to which to escape. Like electronics, you’re unlikely to find anything about temperature control on the product handbook. However, pretty much any reputable supplier will have this critical area well under control. The bottom line is; if you want outstanding quality lighting that can take a beating and go the distance, you are far better off investing in Australian-made products. The savings from cheap, imported knock-offs are almost always a mirage that will leave you with buyers regret. Get it right the first time, and you’ll enjoy years of brilliant, hassle-free lighting that will probably outlast your vehicle. Now, that’s value for money, right there.